RETRO KIMMER'S BLOG: DARK ANGEL PREMIERES ON PBS MASTERPIECE THIS SUNDAY! DARK ANGEL PREMIERES ON PBS MASTERPIECE THIS SUNDAY! Joanne is best known as our favorite the kind lady's maid on Downton Abbey. she takes on a much darker role this time out. Dark Angel is a British two-part television drama miniseries. It is based on the adaptation of the book Mary Ann Cotton: Britain's First Female Serial Killer by David Wilson. 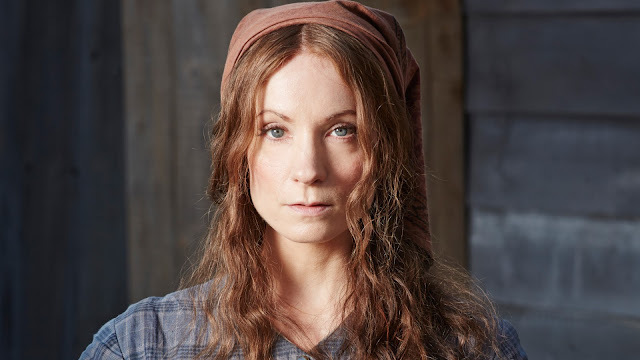 The series premieres on May 21, 2017 in the US and stars Joanne Froggatt as protagonist Mary Ann Cotton. Cotton is widely regarded as Britain's first female serial killer, who was found guilty of murder in March 1873 for the murder of three of her husbands, allegedly in order to collect on their insurance policies. The series also stars Alun Armstrong as Mary Ann's father, George Stott, and Jonas Armstrong as her main love interests, Joe Natrass. Penny Layden, Laura Morgan, Sam Hoare and Emma Fielding also took starring roles in the two-part drama.